Remember the childhood days, when we used to draw a cottage or hut with mountains behind and river in the front, a small bridge and one little world of imagination? If yes, Offbeat Footprints is the place that you are sure to love as it will make you live those moments in real. Recently, we decided to go to Jibhi and we fixed Offbeat Footprints as our stay. 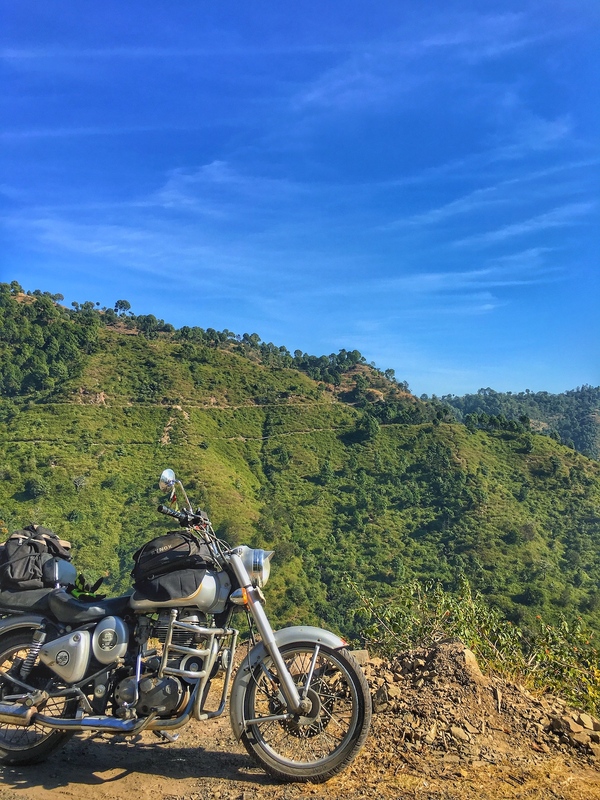 It was a long bike ride, so we divided the journey in two parts : First day, we travelled from Jaipur to Chandigarh where we stayed at our friend’s home and next day from Chandigarh to Jibhi. 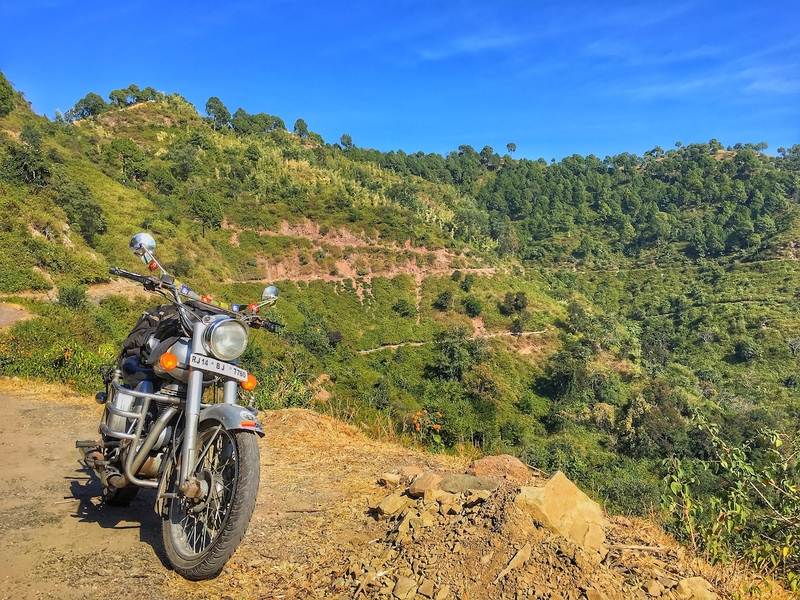 We started our bike ride from Chandigarh a little late in the morning and decided to take a route that is less explored and offers better views in comparison to normal Chandigarh – Manali highway. Though, it took around 3 hours more to reach the destination but it was much worth it. 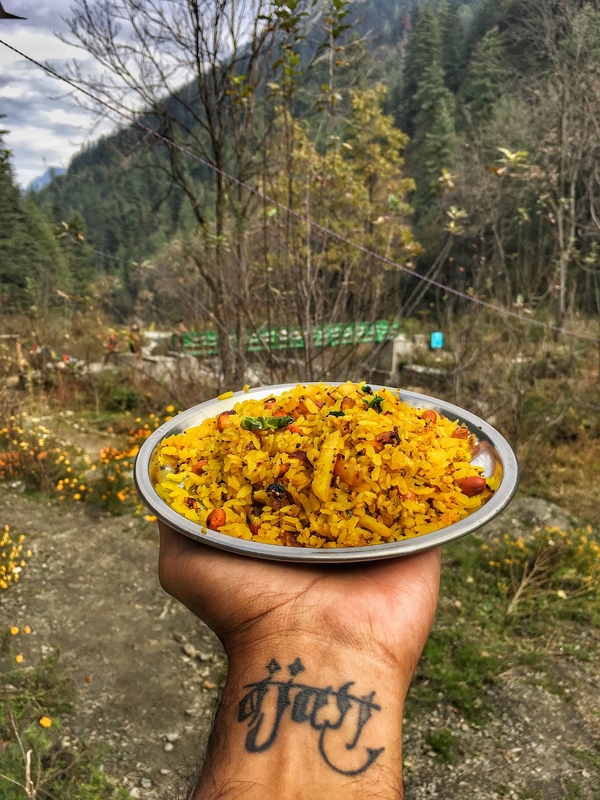 We will talk about the new route in detail in our next post as this post is all about Offbeat Footprints and our experience of staying at that place. We reached around 6:30 PM in the evening, it was dark but Brajesh (the owner of the property) gave us the location to reach the place which was perfect. There’s a reason we call this homestay in middle of nowhere because it is actually ‘Not On The Map’. 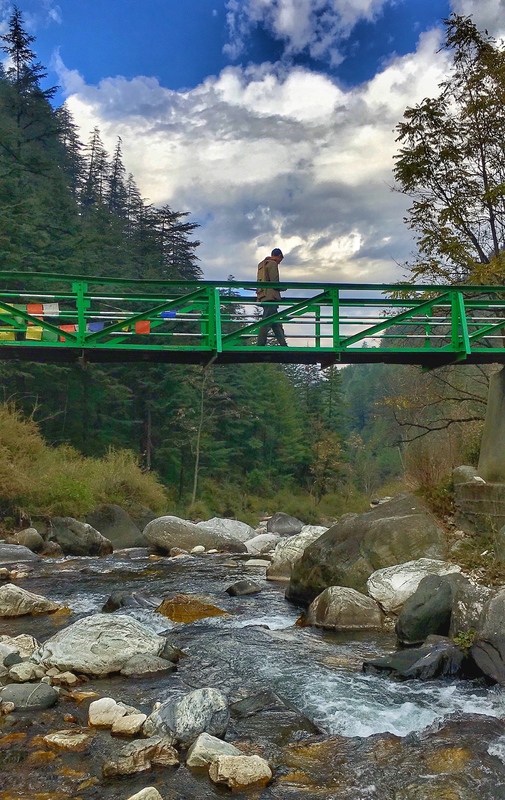 To reach this place, you need to go down towards the valley which is around 500 mts from the main Aut-Jibhi road. So, it’s better not to carry too much of luggage or give prior notice to Brajesh so that he can arrange a pony for you. 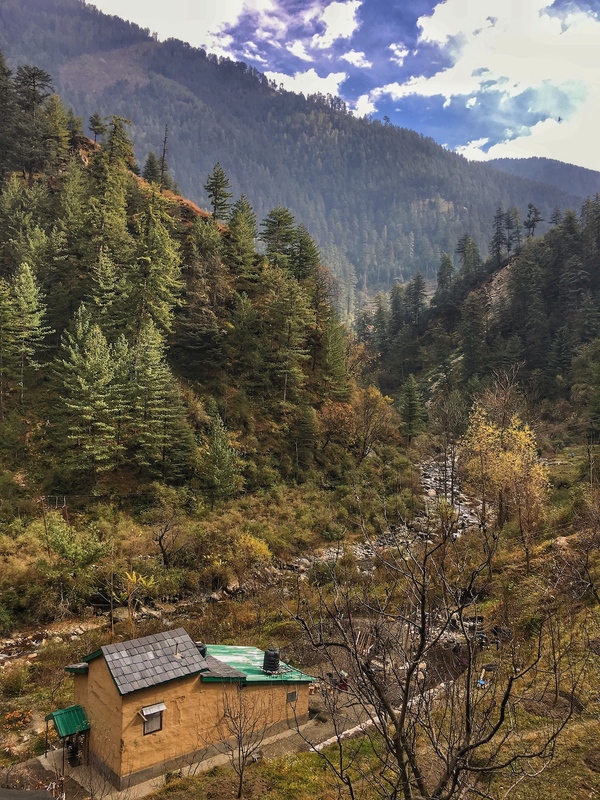 Coming to the property, once again, Brajesh came up to help us find the cottage as we had to walk besides the forests which surely is a relaxing feeling after a hectic travel. Once you get the first sight of the cottage, you will definitely feel that you are at the right place and it is exactly same as the painting you used to make on the paper in your childhood days. 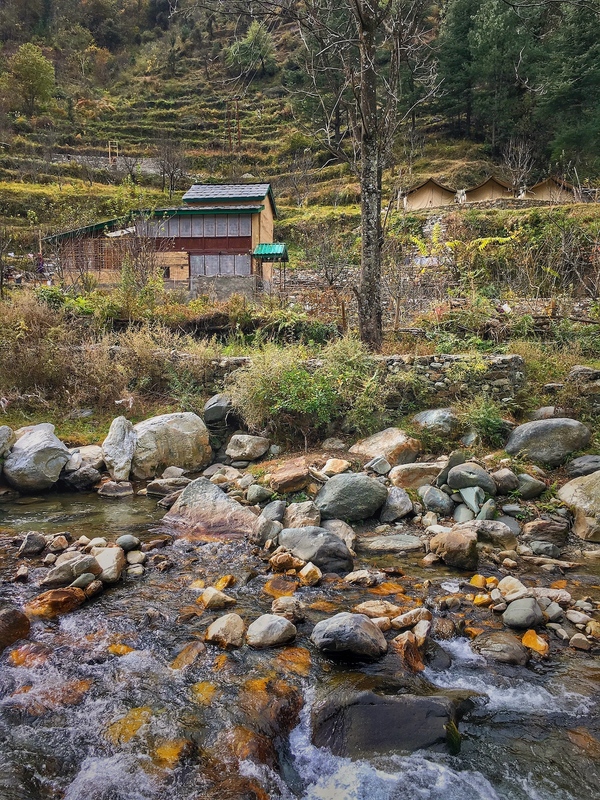 A small cottage with traditional Himachal mud house rooms with mountains at the back and river in the front. Not only that a small bridge that you need to cross to reach the cottage. What more can you ask for? No matter, how nice the property is, the experience is what matters in the end. Let’s see how our 2 days went in one of the most beautiful homestays we have ever stayed in. After we got freshen up in the evening, Brajesh and Archana (co-owner of the property) offered us a nice hot cup of Masala tea with our old favorite Parle-G. A lot of chit-chat happened over the tea. We shared some of our interesting travel stories and they told us how they started the homestay, how the idea came up and much more about the place and vicinity areas. It was rather very interesting to listen to their stories because starting a homestay from the scratch asks for a lot of time and efforts. They showed us the old pictures and believe us they have done an amazing job to make an abode in the middle of nowhere. Brajesh got the arrangements of bonfire done, we did more bakar and Archana made us the dinner. Thereafter, we went straight to the bed as we were quite tired after the long bike ride. Next day, when we got up in the morning and came out of our room, it was spell-binding. 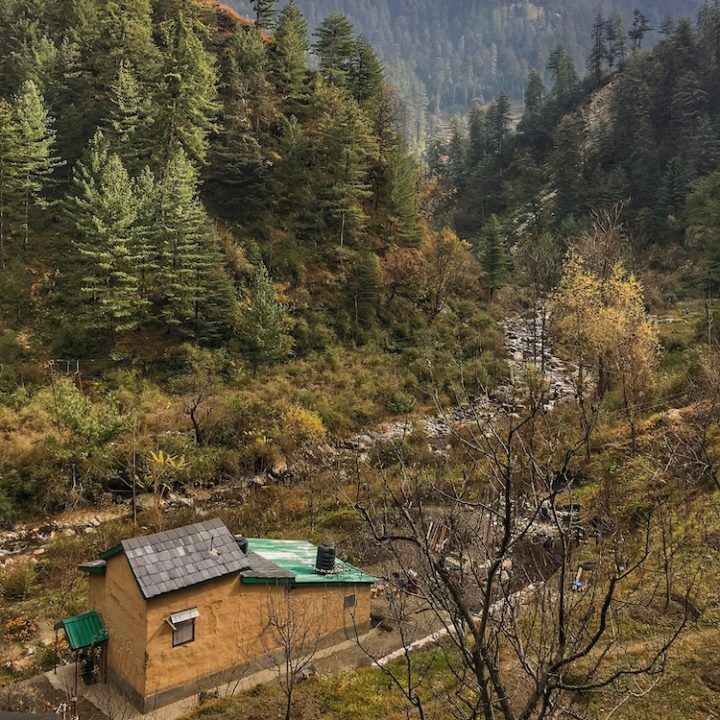 We were actually in the middle of nowhere where we were able to hear only the sound of the river rushing in front of us and birds chirping around. Thereafter, we strolled down to the river which is just in front of the property and sat there for hours doing nothing. It is difficult to find such views in the city and sometimes its great to sit idle and do nothing. There’s an option where you can get the licence and do fishing in the river as there are many trouts but we were more engaged in sitting idle and enjoying the views. There were few locals working in the vicinity, we went there and asked them about their life and culture which was really a wonderful experience. Sometimes, you do not need to do many things when you travel. 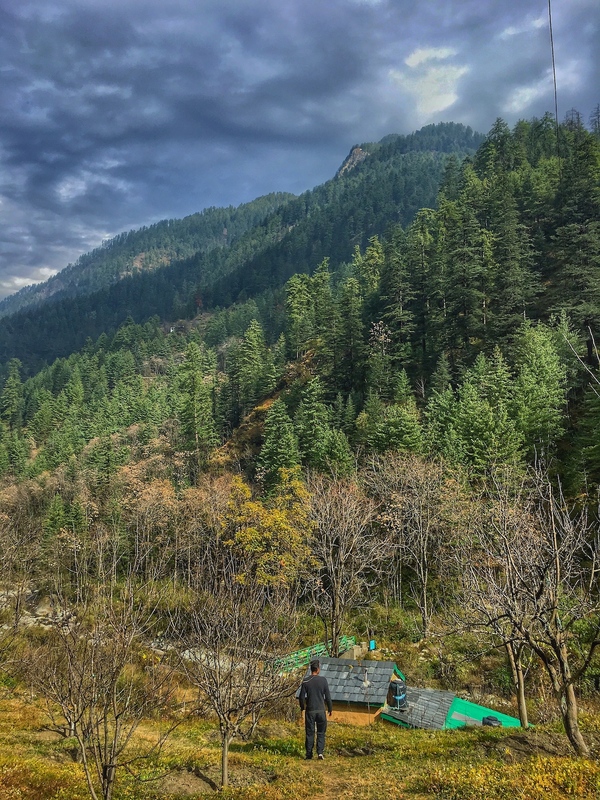 What we did was soaking up the views, listening to the voice of river, talking with locals, enjoying scrumptious meals prepared by Offbeat Footprints guys and just walking down here and there. 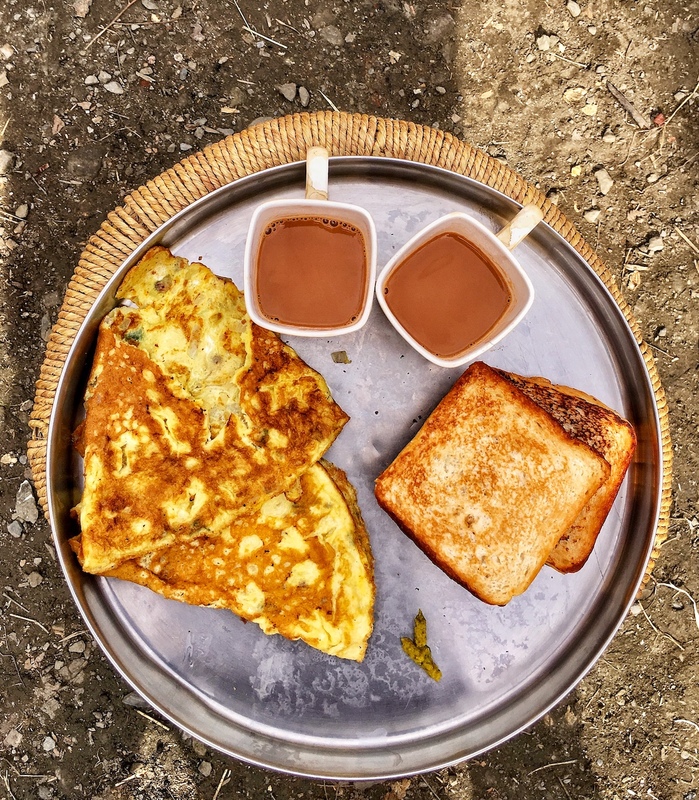 On second day, we got up a little late, had our morning tea with simple yet delicious breakfast. Then, Brajesh took us to one of the hidden waterfall which is just 200 mts behind his property. A little trail will take you to this waterfall which is quite amazing. The views from here were even more amazing and we decided that we will be coming again to enjoy these views by pitching up our tents up there. We told this to Brajesh and he happily agreed. 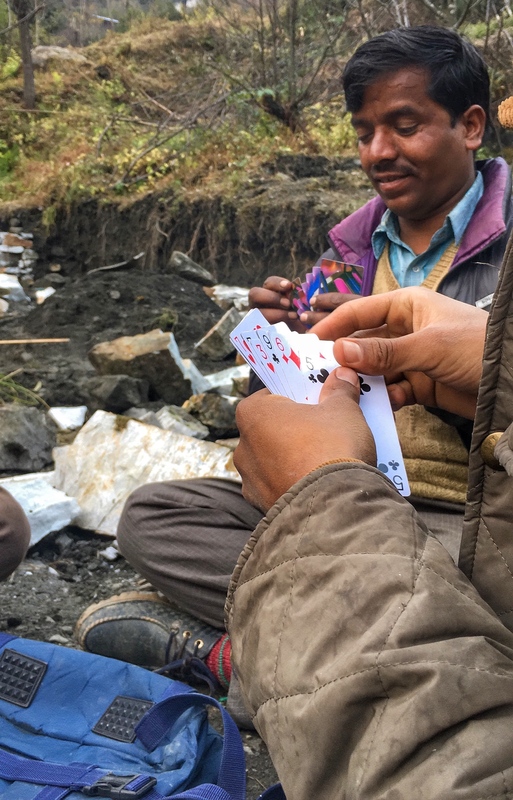 Once we reached back from our hidden waterfall walk, we saw that few locals were playing cards and we instantly joined them. A lot of talks happened over the game and it was really nice talking to local guys who share their stories in such a story-telling ways. We did not want to go but because of some prior commitments, we had to leave early morning. 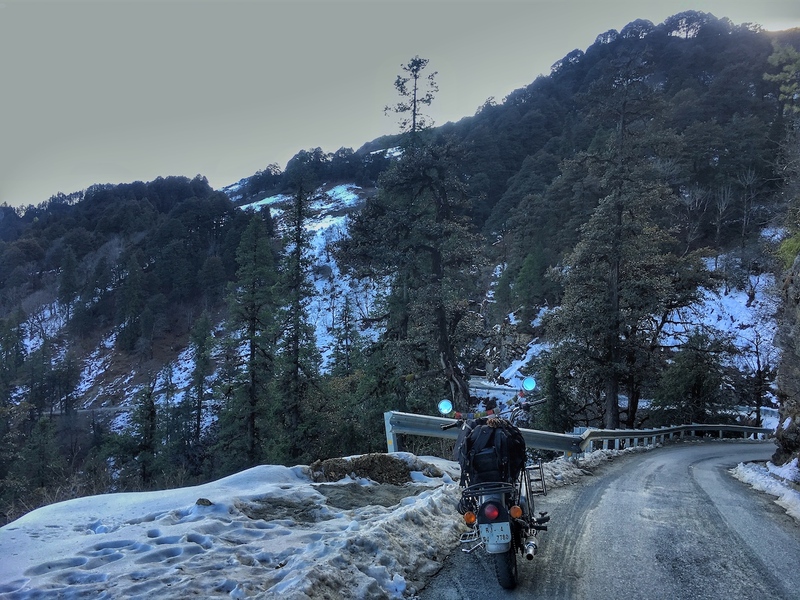 However, we decided to visit Jalori Pass in the morning as there was snowfall a few days back and we did not want to miss the opportunity of witnessing the snow. 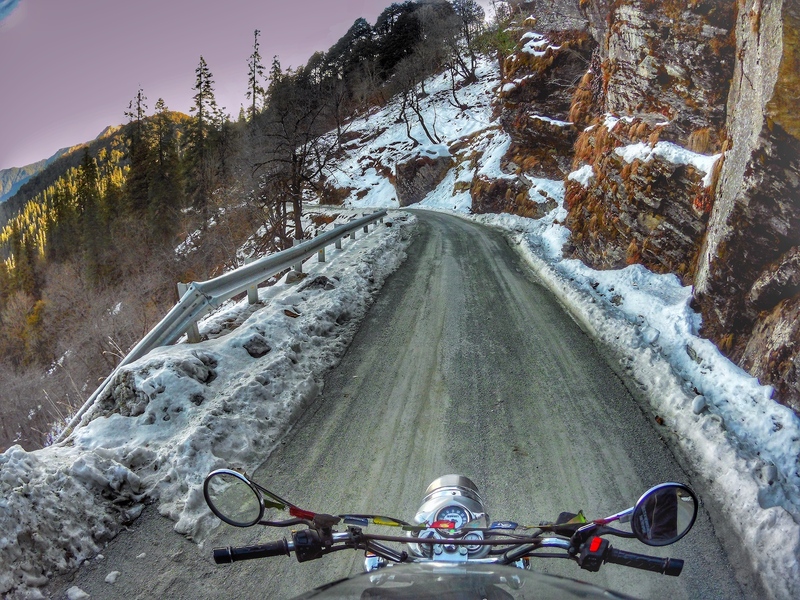 Riding in the snow is all-together a different experience and we went to Jalori pass which was as usual beautiful. This was our third trip to this beautiful place and it never ceases to amaze us. This is one more USP about the Offbeat Footprints. Despite that it is in middle of nowhere, still everything is in vicinity. 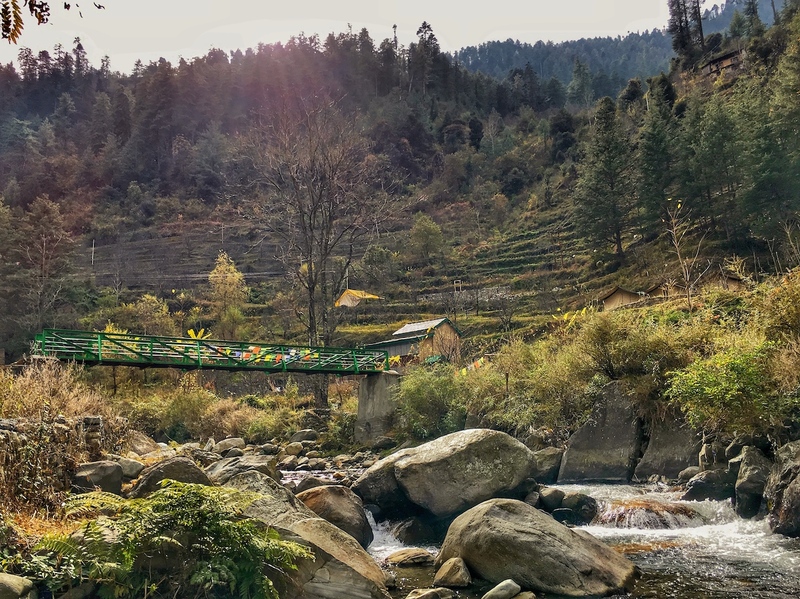 Jalori Pass is around 10 Kms from the property. Ride on the asphalt is just amazing. 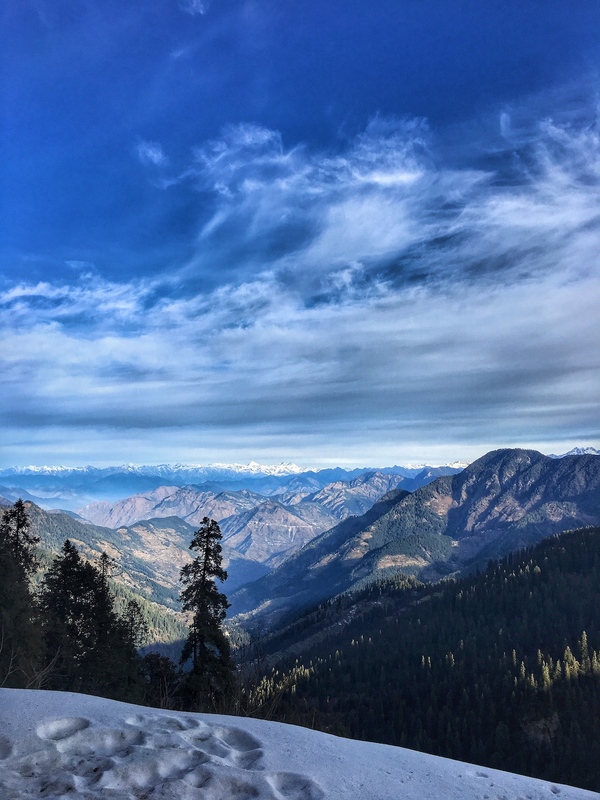 We would recommend you not to miss Jalori Pass as it offers mesmerising views all around the year. The experience we had is way beyond to put in words. Still we have tried to share our experience with you all. Offbeat Footprints is not one of the biggest properties as Brajesh kept it very simple with all the essential things that guests would need. The ground floor has one room, kitchen and a shared bathroom with a common space where you can chill with other guests, play indoor games and the best part is that you can relish the yummy food here itself while sharing your travel stories with other travellers and vice-versa. The other room is on the first floor and they have this small attic room on the upper floor room which we loved the most. 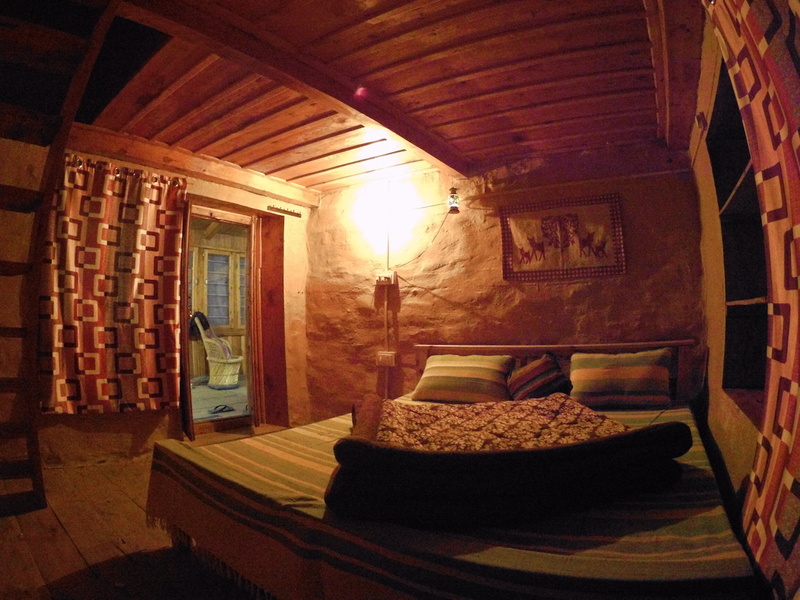 Both the rooms were built in old traditional Himachali style from mud and the ceiling and doors are kept at comparatively smaller to make the rooms cozy in harsh winters. The upper floor has a common seating space too with well-equipped bathroom. 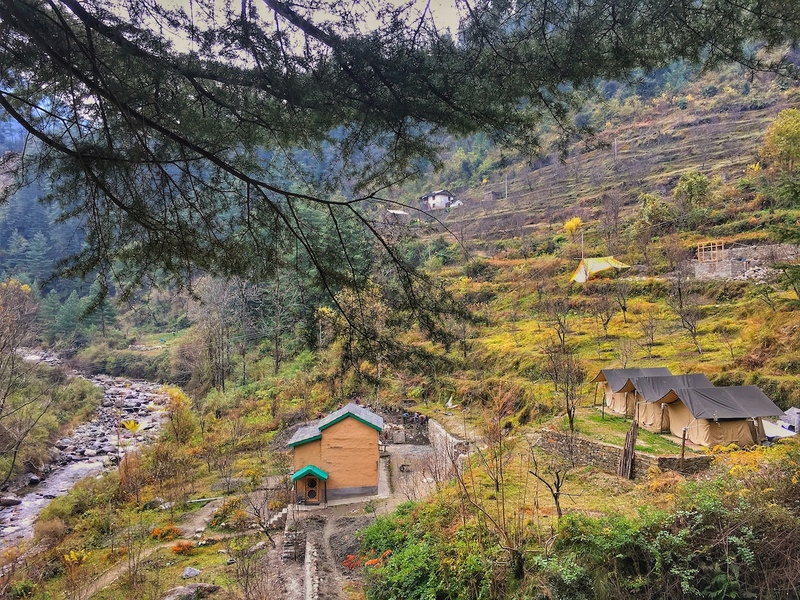 Other than the room, they have three Alpine tents just above the cottage for those adventurous people who love to stay in camps specially in mountains. Believe us, the view from these tents is simply amazing which you will not forget for a long time. There are three bathrooms next to the Alpine tents as well. They have plans to set up more Alpine tents in the future to accommodate more guests. One thing we noticed about the tents in their premises was that they were very cozy in comparison to the ones we stayed in till date. This is because they have actually hunted for the insulated material to make these tents. It was -3 degrees at night when we went there and we were feeling warm even with only one blanket. Kudos to the efforts of the people who have worked hard to make sure that the guests don’t have to face any problem. 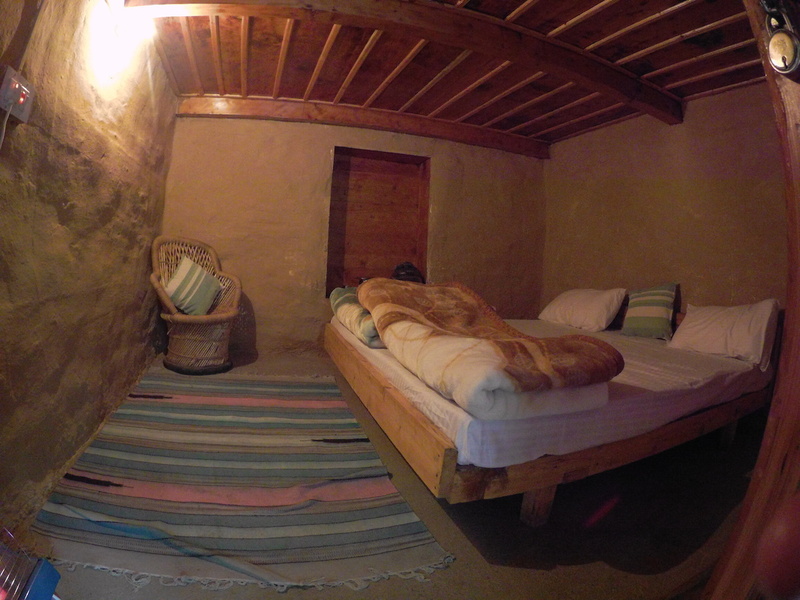 The rooms are warm and cozy because of the low ceiling and the way they are made. Not only that, they have room heaters as well which you can use if you are feeling very cold and they can give you the extra blankets as well. All sorted, right? 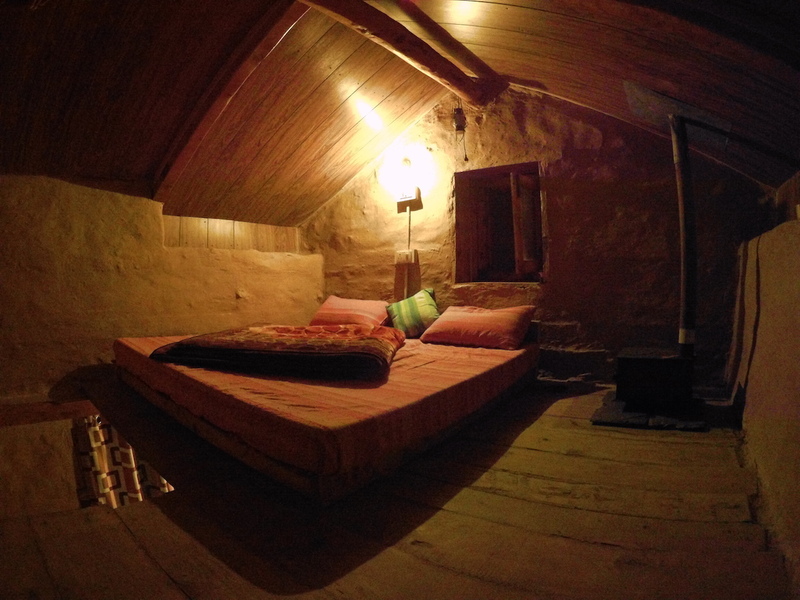 Excited enough to book this property for your next trip to Himachal? Wait, that’s not all that we have to share with you all. We haven’t told you about the food yet. So, check out our say on the food they serve. The food served here is simple yet super delicious. 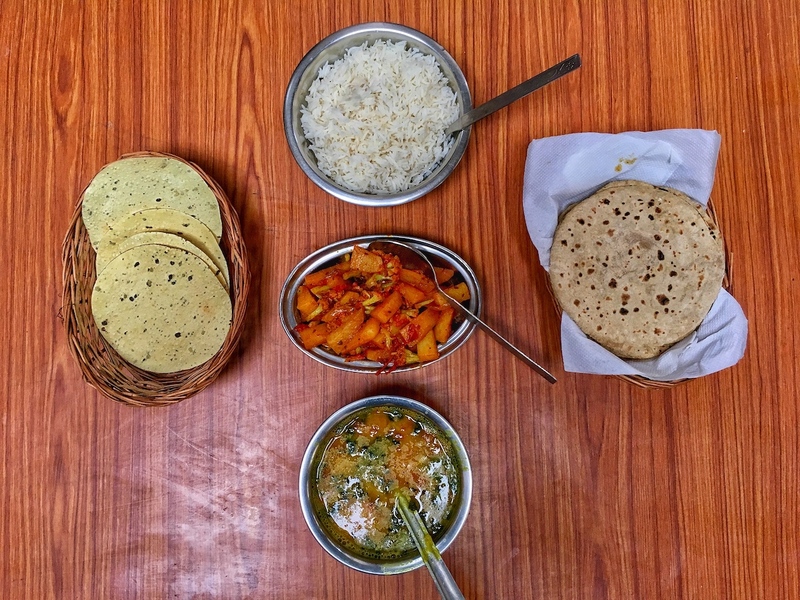 They mostly serve lip-smacking vegetarian food but if you are craving for non-vegetarian food, you can ask them and they will cook it for you. Brajesh who owns the property is all ears to let you have your say. You will feel like you are here to visit some relative and enjoy the best home cooked. There are many things to do around Offbeat Footprints but believe us you won’t want to leave this place and go somewhere out. However, we surely will list down some of the places for you to explore. This is in a small village called Chaini, very close to Jibhi, where you can go early morning for a cool breeze around the waterfall. It’s a small yet beautiful waterfall where there are high chances of witnessing the rainbow. An old fortified tower with a simple which was built around the 17th century and made of wood and stone is an architecture marvel which we feel you should not miss if you are in Jibhi. 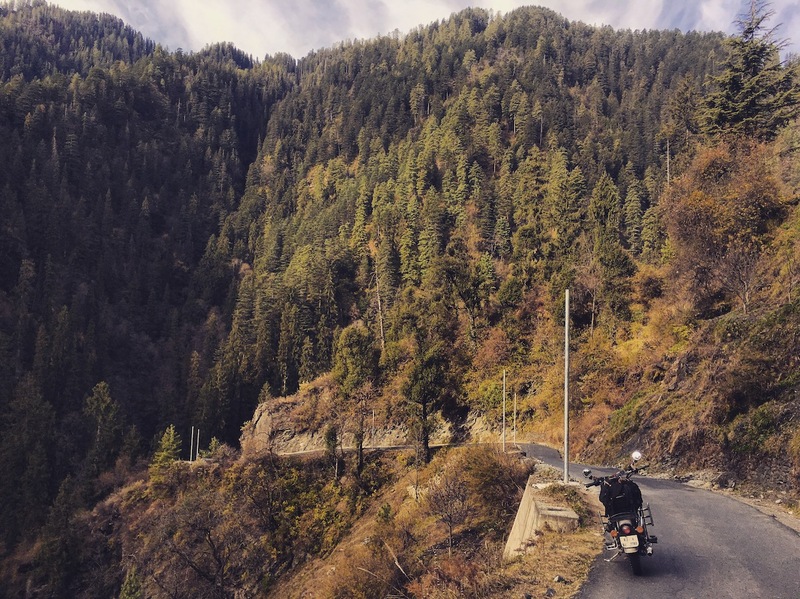 Jalori Pass : A drive or ride to Jalori Pass is totally recommended where you can see amazing vistas all around. Do not forget to have Rajma Chawal in the small Dhabas located there. Located at an altitude of 3199 m, this lake is surrounded by thick vegetation of alpine forests. The water in the lake is very clean. Though this didn’t happen in front of us but some local people told us that there is a belief that the birds around the lake do not let even a single leaf fall in the lake and if it does, they take it out of the lake. Not just that, the water of the lake is believed to have medicinal properties too. 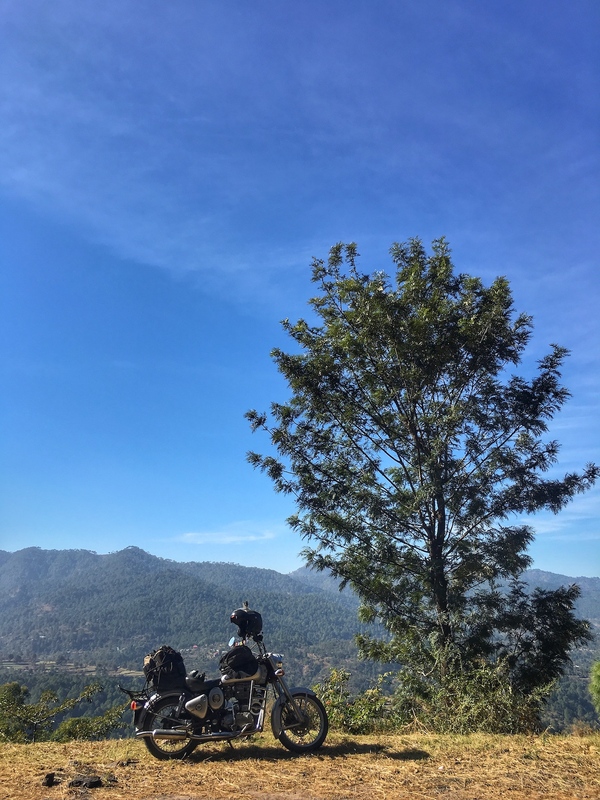 Other major attractions include Raghupur Fort Trail which starts from Jalori Pass, you can do trout fish hunting too but for that you need a license (Brajesh will help you if you are interested). 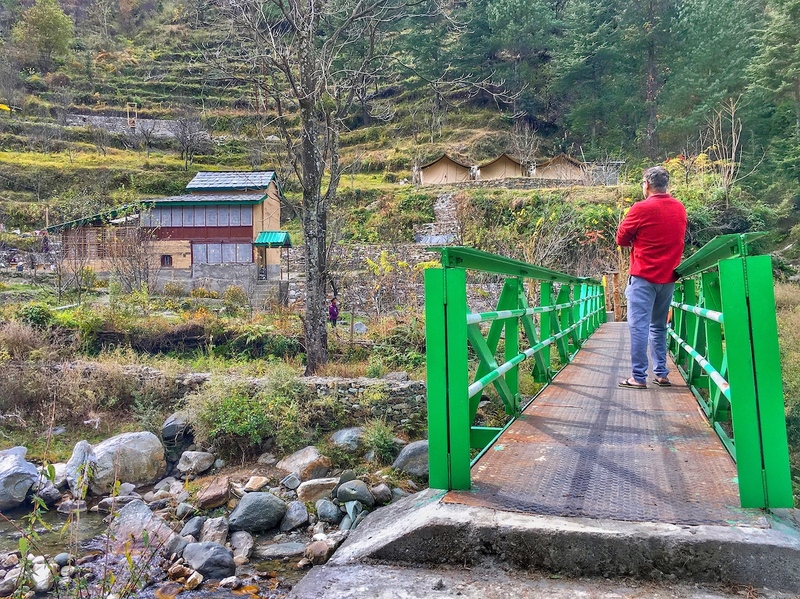 Banjar Valley and Shoja are other places worth visiting. 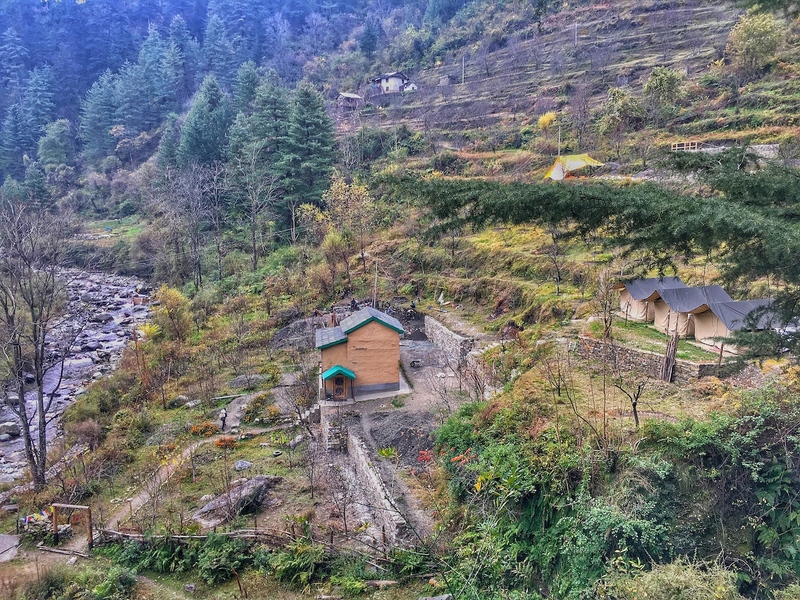 This eco-friendly stay – Offbeat Footprints is around 25 Kms from the Aut tunnel. Take a shared taxi or a local bus from Aut tunnel if you are not traveling by your own vehicle. The trail for Offbeat Footprints downside starts just before the milestone where it shows Jibhi is 3 Kms. Travel light as you will have to walk on the trail for around 500 mts. 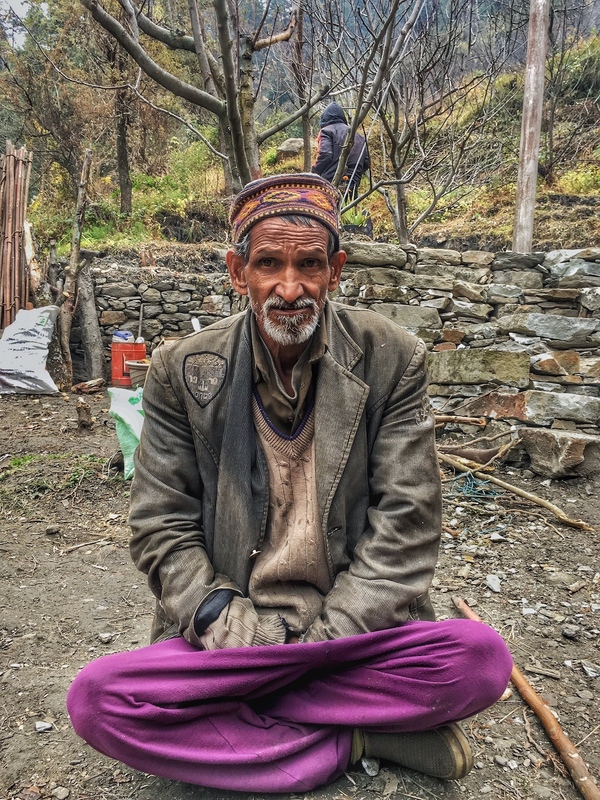 You can call Brajesh once you reach Aut tunnel and he will help you to reach the place by giving you all the necessary directions. We suggest you to reach before the sunset as the property is located in the dense forest and you might feel uneasy if you are coming for the first time. We spent two nights in Offbeat Footprints and we loved the place so much that we wanted to extend our stay. 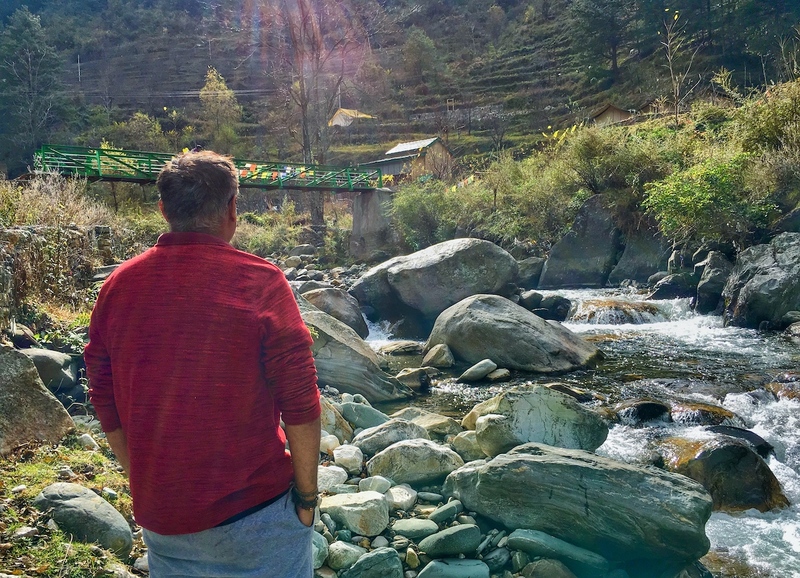 Yes, this place has everything a person looks for in their stay : Peaceful place, riverside front where you can do fishing, a hidden waterfall just 200 meters from the property, a small village where you can go and talk with locals. Food which is simple and served with love that makes it far more a better option for stay when compared to any five-star hotel. Not only this, Brajesh is gem of a person with whom you can talk endlessly and enjoy the stay to the core. Wait, that’s not all, you can get 15% off if you DM coupon code ‘Yogesh’ on their Instagram Profile (https://instagram.com/offbeat_footprints). Isn’t this, amazing? So, what are you waiting for! Pack your bags to visit this place which is ‘Not On The Map’ and share your experiences with us. P.S : Special thanks to StayOnSkill for enabling us to take this trip to Offbeat Footprints. Such beauty, I immediately wanna pack bags and go there. I am sure you had a lovely time. Oh yeah, we enjoyed the place to the core. We wish you to explore this property as soon as you get time! Such Beautiful Property it is. Indeed with super natural views and the mud house experience, I am sure you had a lot of fun. 🙂 Nice one …. Wow wow wow…Brajesh Ji actually brought back the childhood paintings turn into reality. The flow of the article made an intresting read and can’t appreciate enough the spellbounding beauty of Jibhi and above that of so thoughtfully built home. So true, Brajesh has done an awesome job creating Offbeat Footprints from the scratch. And we totally agree with you Jibhi is a beautiful place and best part is still a hidden gem and not that tourist. Hope this remains for a long time. The place is really beautiful. Seriously, what more one can want if you have a place to stay like this in the middle of nowhere. The hidden waterfall is surely a place that I would love to explore. And I love the photographs. They make me want to visit the place soon. You should visit this place, we are sure you gonna love it. 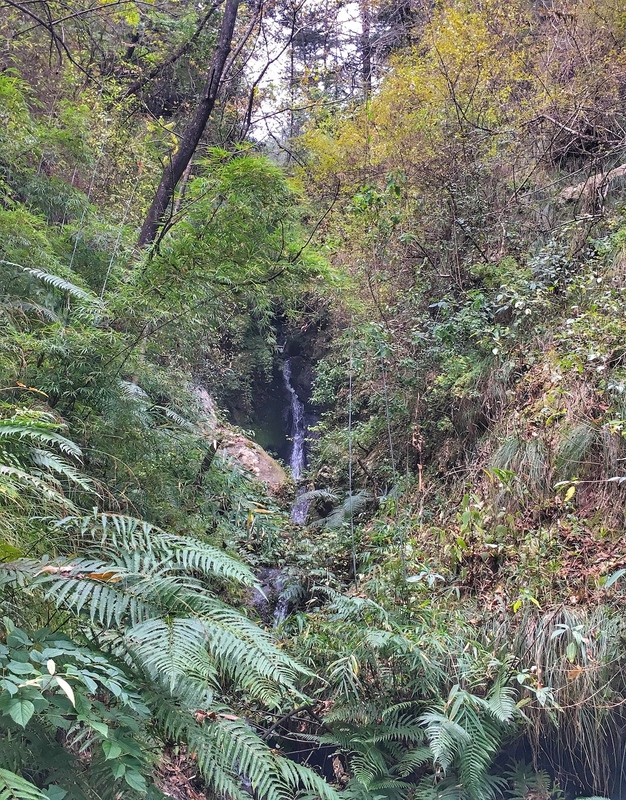 Even the hidden waterfall is a place to go and it is just beside the property. You will get the discount as well if you give them my name. 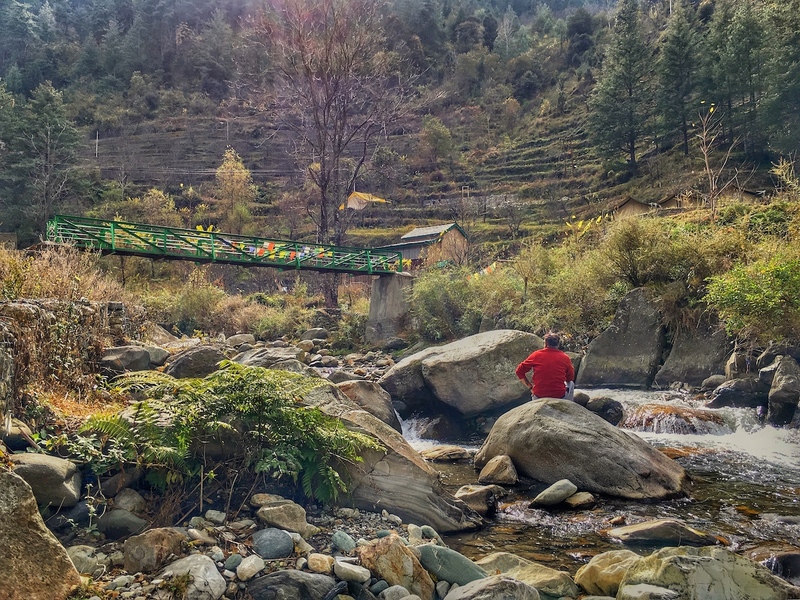 The bakar session with the property manager or the person responsible with endless cups of chai and afternoon siestas are the best in the lap of nature . That cozy little bedroom just gave me a surreal feeling of packing my bags and leave .. You have done a wonderful job of bringing out the beauty and the vibe of this place through your narrative story. You should definitely visit this place soon. Let’s plan it sometime when you are back on the floor. 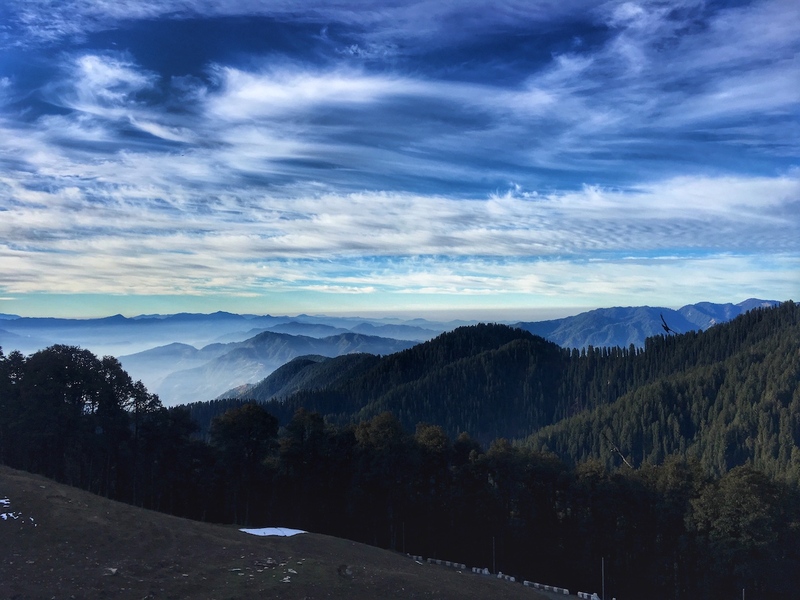 Let’s all plan and explore on the hidden paradise in Himachal Pradesh.